S.V.V. 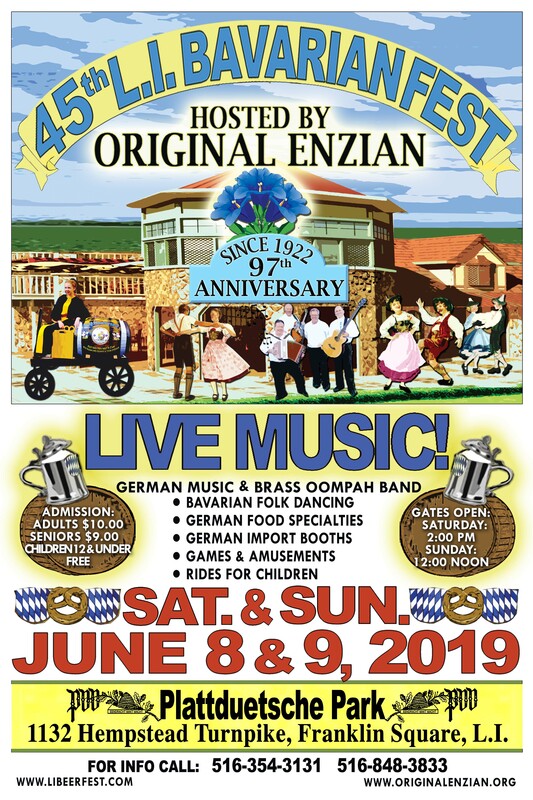 Original Enzian cordially invites you to join us at our 45th Annual Long Island Bavarian Festival on the weekend of June 8th/9th, at Plattduetsche Park Restaurant, 1132 Hempstead Tpke, Franklin Square, NY. Enjoy live music in an Oktoberfest atmosphere including Schuhplattler performances by our adult and kindergruppe, German food specialties, German import booths as well as games, amusement and rides for the kids. Live music, provided by the Foehrer Musik Freunde (authentic German brass band) and Die Spitzbuam, will entertain the crowds on both Saturday and Sunday. Doors open Saturday at 2pm and Sunday at 12noon. Please see our ad and flyer at www.libeerfest.com. We look forward to seeing you!